Taumaka is a 20 ha Māori-owned island lying about 4 km off the South Westland coast. Our visit to the island last month was to track foraging trips of breeding tawaki / Fiordland crested penguins, and was undertaken with the permission and support of the Taumaka me Popotai Trust. 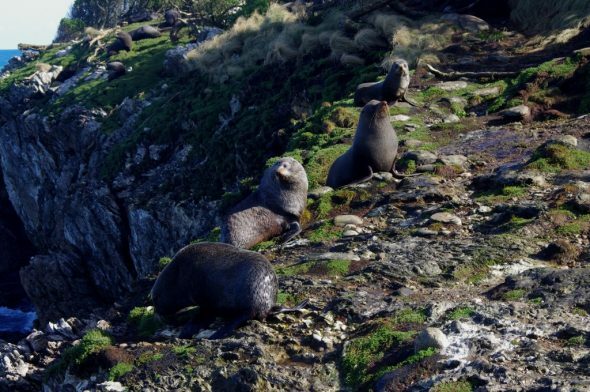 The island has a large New Zealand fur seal / kekeno rookery, though it is only a fraction of what it was 210+ years ago. Sealers visited Taumaka, and killed more than 11,000 seals between 1810 and 1826. Notable among these was a gang of ten men from the Active, who were marooned on the island (and the adjacent mainland) between January 1810 and November 1813. 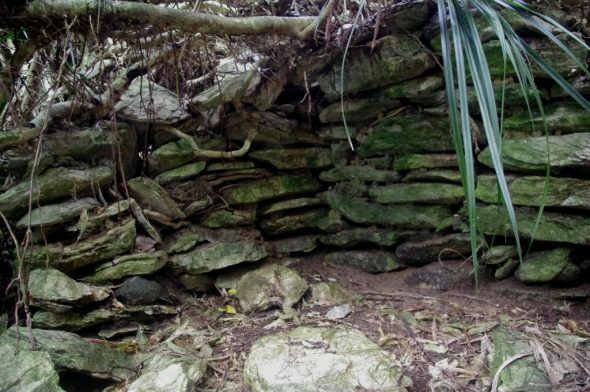 The remains of one of their shelters was concealed under a tangle of kiekie until it was rediscovered on Taumaka by penguin researcher Colleen Cassady St. Clair and her husband Bob St. Clair in 1989. It is considered to be the oldest surviving European building in New Zealand. 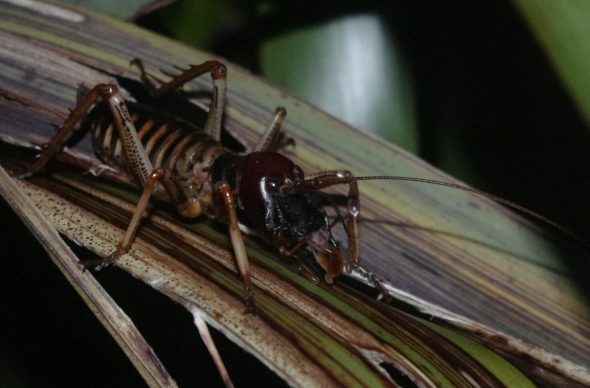 Tree wētā are still common on the island if you look for them, but they are much less abundant than described by Charlie Douglas, and you would have to be lucky (or unlucky) to have one dance a hornpipe on you. The reason why wētā and leeches have become much scarcer on Taumaka is that weka were introduced to the island on at least two occasions between 1905 and 1912. 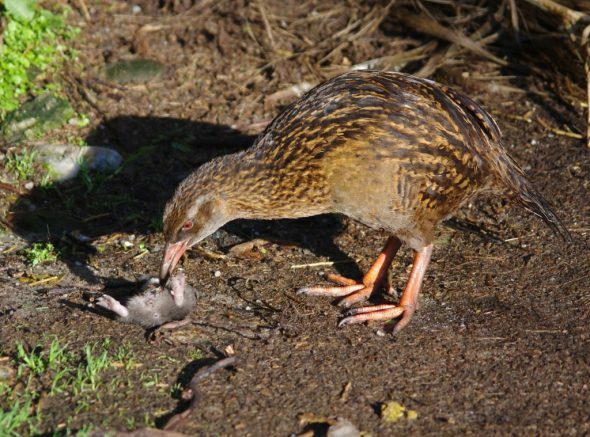 Weka are now very abundant on both Taumaka and neighbouring Popotai, and are also the reason why the islands’ two lizard species remained undiscovered for so long. 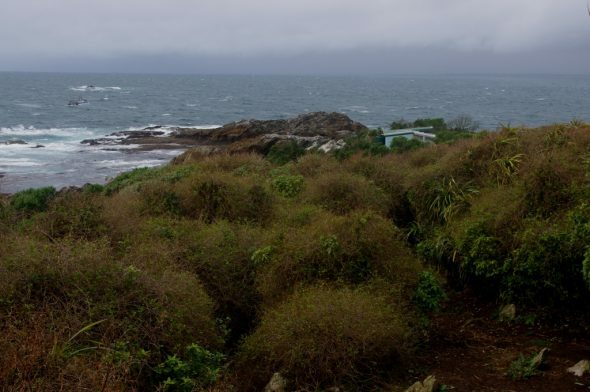 Post-graduate students from the University of Canterbury began fur seal research on Taumaka in 1968, and the university built a small hut at the north-east end of the island in November 1969. Botanist Colin Burrows visited the following April, when he was surprised to find two small geckos among the dense vegetation. The Taumaka gecko (which has yet to be described and given a scientific name) then remained hidden – despite numerous searches – until rediscovered by Canadian herpetologist Bob St. Clair in 1989. It has so far been found only on Taumaka and is considered endemic to the island. 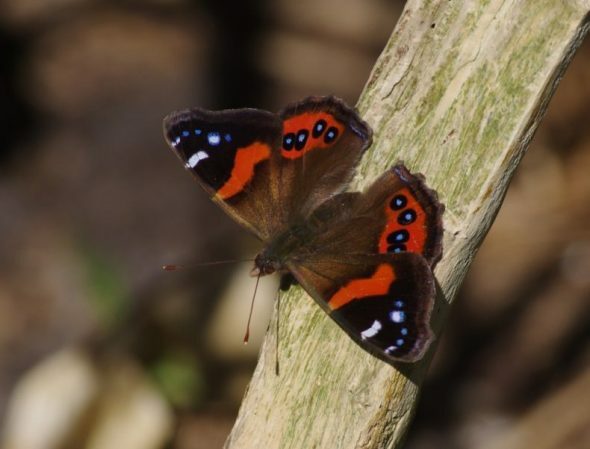 Colin Burrows also mentioned seeing several red admiral butterflies on the island in April 1970, and we saw a few in September 2016. Their larvae feed on the tree nettle (Urtica ferox), which – fortunately for us – was scarce on the island. Skinks were not discovered on Taumaka until November 1986, when seal researcher Peter Carey found some living around the hut. They were described as a new species (Oligosoma taumakae) in 2007, and have since been found on three other tiny islands in South Westland. 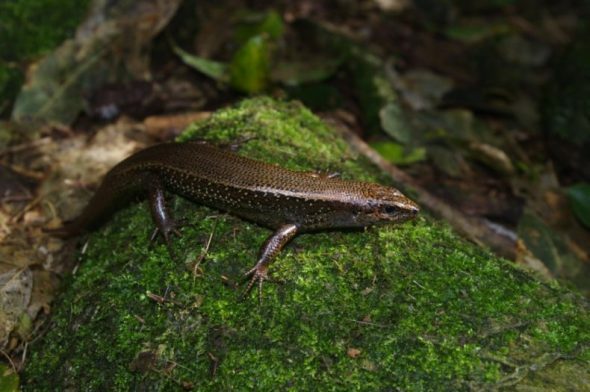 The Taumaka skink remains scarce at its type locality, but we saw at least eight individuals during our visit. 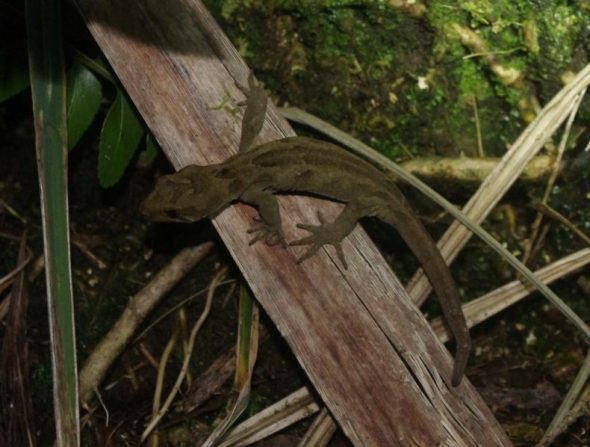 Taumaka and Popotai were connected to the mainland as recently as 10,000 years ago, which is a short time for a species as distinct as the gecko to have evolved in isolation. 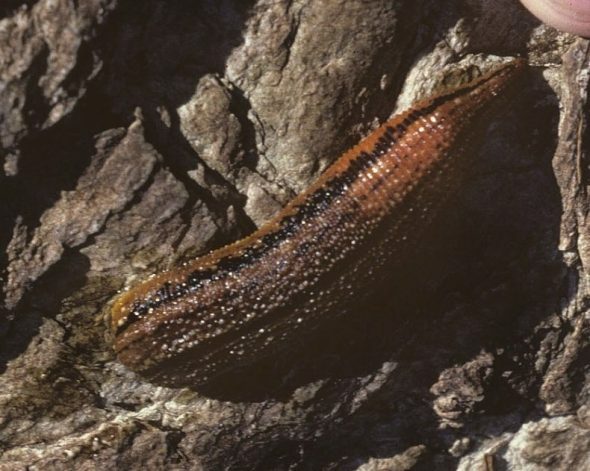 Along with the Taumaka skink and leech, it is more likely that all these species were present on the adjacent mainland before the introduction of mammalian predators. It is possible that a few individuals are still clinging on there awaiting discovery, but Taumaka is undoubtedly their main, if not only, refugium. 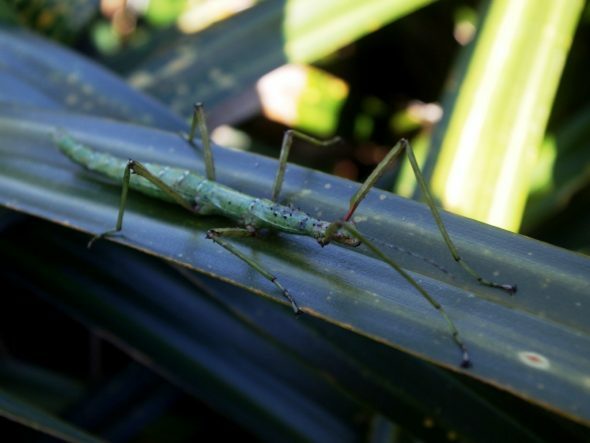 One critter that we observed may be a new record for the island – a prickly stick insect (Acanthoxyla prasina). A large female was found in a kiekie crown 3 m above the ground, near the only kamahi that we saw on the island (kamahi is a known food plant for this stick insect). 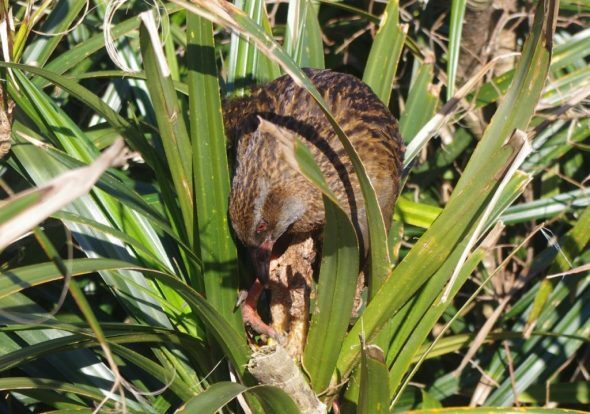 While living among foliage may give some protection from weka, we did see weka climbing through and feeding high in kiekie, including on kiekie fruit. The winter-breeding seabird project is a collaboration between Te Papa, Deakin University (Melbourne), and CNRS, Chize, France, and is led by PhD candidate Tim Poupart. Thanks to Peter Carey for information about the skink discovery, and Thomas Buckley (Landcare Research) for advising on the identity of the stick insect and its host plants. PS: Well done with the great photos of such rare beasties! It was a highlight finding the geckos (we saw 4 of them) after failing to find them on previous visits.